To sign up to the Arrowfile Collectable Storage Newsletter, simply click the Request Newsletter button below and you will receive amazing special offers, discounts and access to secret sales. 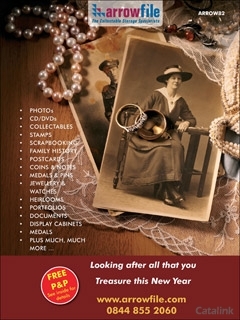 You can download the Arrowfile Collectable Storage Catalogue instantly as a digital iCatalogue [?]. View the Arrowfile Collectable Storage Online Catalogue Now! Are you aware of the inherent dangers of storing your photos on digital storage? Digital Photographs are easy to take, but also easy to lose. Electronic devices are constantly being out–dated, lost or stolen. Your computer can crash or become beyond repair. Formats change at an alarming rate and become defunct. Equally letters, documents and memorabilia, collectables or family heirlooms can be inadvertently be thrown away or irretrievably damaged. Arrowfile is one of the country's leading archival storage specialists, dedicated to providing the best and most cost–effective ways to help photographers, hobbyists and collectors to protect, organise and display their precious images and objects. From photographic images including negatives and slides, CDs/DVDs, scrapbooking to a wide range of Collectables including Stamps, Coins, Postcards, Medals, old family letters, documents and certificates the list is endless. Arrowfile offer binder albums and archival and Acid–Free varying size pocket refill pages made from either top quality polypropylene or polyester that allows collectors to break away from the limitations of ordinary albums and to meet their every need – past, present and the future and to guarantee archival protection for generations to come. With quick and easy access, you can create your very own multi–functional binder system to build up your own unique collection. There is no limit to how many times you can insert, remove and reorganise each individual binder. For other collectable items including medals, pins, mementos and coins Arrowfile offers a wide range of collector display cabinets, cases, trays and drawers. See the sensational seed, plants and equipment range at D.T. Brown. Their commitment to quality and value for money brings you a growing collection you can trust to deliver. All your plant, fruit and vegetable growing needs in one place. By Pressing the Request Newsletter button you give Arrowfile Collectable Storage (and their Data Processors for the specific purpose of delivering your emails) consent to send you their newsletter via email until such time as you choose to unsubscribe.